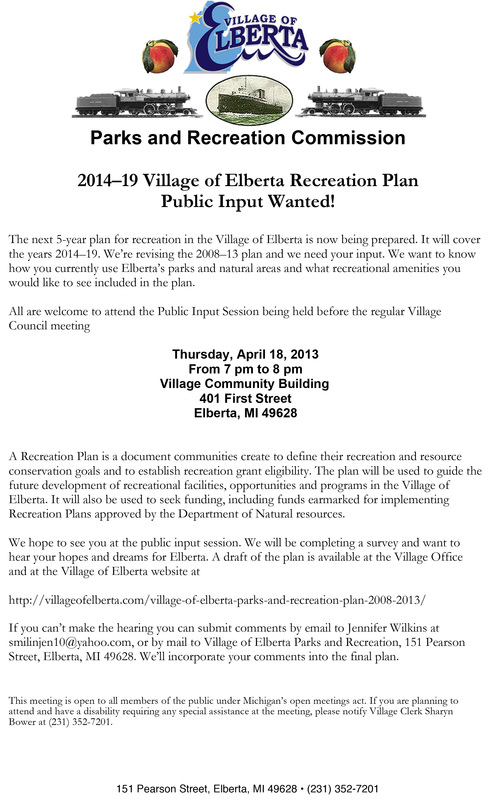 Please plan to attend the input session on April 18 at 7 pm in the Village Community Building! See details below. Vickie Smith, of Wildlife and Wetlands Solutions, will be applying an herbicide to stands of phragmites on Thursday beginning at 9:30 a.m., weather permitting. She’ll begin with the stands near the Luedtke Boneyard and proceed around to the Elberta M-22 and railroad/trail bridges, after noon. The spraying will be postponed if conditions are windy. This is a continuation of the war on phragmites begun last year, organized by the Friends of Betsie Bay in cooperation with Benzie Conservation District, the Benzie Watershed Coalition, and other groups (Pearl Lake Association; Herring Lakes Association, Grand Traverse Regional Land Conservancy and the Betsie River Restoration Committee). Phragmites australis is an invasive variety of tall weed grass that had taken over large swaths of the water’s edge in the area around the mouth of the Betsie River. The treatment performed last fall seems to have killed off a great deal of it—cattails have resumed dominance between the two Elberta bridges—but generally areas need to be retreated for several years for complete eradication. An aquatic herbicide is applied to the phragmites. The herbicide works by disabling a plant hormone. So far local conservation groups have found no studies showing the herbicide to harm fish or other fauna. Still, it’s probably a good idea to avoid direct exposure to the chemical. It was a not so nice Memorial Day for one local vet: Bill Buck’s new three-wheel bike was taken sometime between last night (Memorial Day Monday) and this morning. The bike was in the Bucks’ yard right by their house on Washington Avenue. They would very much appreciate its return! Among other things, the bike (red, smallish, basket on the back) was helping the 81-year-old get some exercise—he suffers from arthritis. Looks like our neighborhood-watch team needs some drilling. Please send any info to elberta.alert@gmail.com, or call the Sheriff, who has been notified. The public hearing on the land use permit denial(s) for the Bay Valley Inn property, purchased by Loy Putney, will be held tomorrow, Wednesday, May 30, at 7 pm at the Village Community Building. All are welcome to attend and give their comments. This is a resumption of the hearing that was canceled on April 25. The Village Council’s new delegate to the planning commission, Linda Manville, replaces Ken Holmes on the Zoning Board of Appeals. Putney wants to modify the old Bay Valley Inn building and use it for worker housing. Putney filed suit against several members of the Village leadership and the zoning administrator on March 28, alleging civil rights violations and improper procedure. Ken Bonney, our DPW, would like everyone to know that free wood chips are available from the tree cutting (and replanting) efforts around the Village this fall. Chips may be picked up at the Village Garage. Ken can be reached at 231-651-9626. Leaves may be dumped at the end of First Street, near the Village Community Building. Please do not dump any plastic or other bags—just the leaves. Today, November 4, Bob and Bernice Beugnot celebrate their 65th wedding anniversary. Bob grew up in Elberta and Bernice in Frankfort. Here’s to their lasting union! At the regular Village council meeting on Thursday, the Board of Trustees will consider the following wording for a lawn maintenance ordinance (see enclosed pdf). There will be opportunity for public comment at the meeting as the wording is reviewed. The ordinance would then come up for a vote as soon as the November council meeting. It’s quite a detailed document, much more elaborate than the Frankfort ordinance on which it’s based. Note in particular the list of unacceptable weeds, and the requirement that vacant lots be mowed to a depth of 30 feet from the street. This Wednesday night, October 5, a benefit spaghetti dinner will be held at the Mayfair Tavern from 4 pm to 9 pm for Kelly Beaton, who was recently diagnosed with cancer. Dinner is by $10 donation, with a cash bar. One hundred percent of proceeds go toward medical expenses for Kelly, who has no health insurance and is unable to work. The Village of Elberta and several area property owners have given permission for phragmites eradication on several sites in Frankfort and Elberta. The invasive “common reed” has been known to overtake wetlands and shorelines, destroying native habitat for fish and wildlife, and has been successfully fought off in Beaver Island, Onekama, and Emmet County. The Friends of Betsie Bay in partnership with the Cooperative Weed Management Area, the Grand Traverse Regional Land Conservancy, and the Nature Conservancy have undertaken to secure funding for eradication this year and for the next two years. The following is a press release by the Friends of Betsie Bay. Wildlife and Wetlands Solutions will be applying herbicide to the Betsie Bay, Betsie Lake, and Betsie River shoreline to control invasive phragmites between Sept 24 and Oct 10, 2011. Our target date for this project is September 27th, but weather conditions must be conducive for a foliar spraying by a State licensed aquatic applicator from Wetlands and Wildlife Solutions, of Traverse City. This collaborative effort for the 2011 season has been funded by several grants from the Nature Conservancy through the Grand Traverse Regional Land Conservancy and the Cooperative Weed Management Area on behalf of the Friends of Betsie Bay. This will be the first of likely a 3-year project to control phragmites. Phragmites is controlled using glyphosate, imazapyr, a surfactant and a tracer dye. Application will occur by foliar spraying with a backpack sprayer, by boat or using a tank sprayer with an ATV. Signs will be posted to all treated areas stating the date of application and listing water restrictions. PLEASE NOTE: Water access is restricted for 24 hours during the application process to avoid contamination. We sincerely apologize for any inconvenience this may cause for the many fall recreational activities such as fishing, boating, etc. We’re hoping this minor inconvenience will be far out weighed by the future health of this bay area. A risk/benefit statement concerning herbicide treatment is available at the municipal offices of Elberta, Crystal Lake & Gilmore townships and Frankfort. Or visit the Friends of Betsie Bay at www.friendsofbetsiebay.info. Also check this edition of the Record-Patriot’s legal ads for an abridged version of the statement. For more specific information on the herbicide application procedure or timing of application, please contact Wetlands and Wildlife at (231) 943-0762 or visit wildlife@wildlifewetlands.com. E²: Eclectic Elberta! For the third year, Conundrum Café and Park and Rec are running a free market day on Labor Day Sunday (Sept. 4). Do you have something, anything, you want to sell? (Food, crafts, vintage items, et cetera…) Booths are free. Call 231-352-8150 to reserve a spot. Or just hold your own yard sale on the same day. We’re hoping to get a big crowd running through the Village.